Portfolio for JIRA now lets you accurately schedule the work of teams that are sharing a board, and are working in parallel sprints. Conflicts happen when there are overlapping start or end dates across the active parallel sprints, or when one sprint ends and another sprint starts on the same day. Portfolio for JIRA notifies you about the overlapping sprints on your board. You can choose to resolve the conflict at the time, by assigning each sprint to a different team. You can also consider assigning future sprints to your teams, to avoid future conflicts. Select the checkbox for the sprint that you want to assign to each team. In your plan, go to Teams and find the team you want to assign a future sprint to. 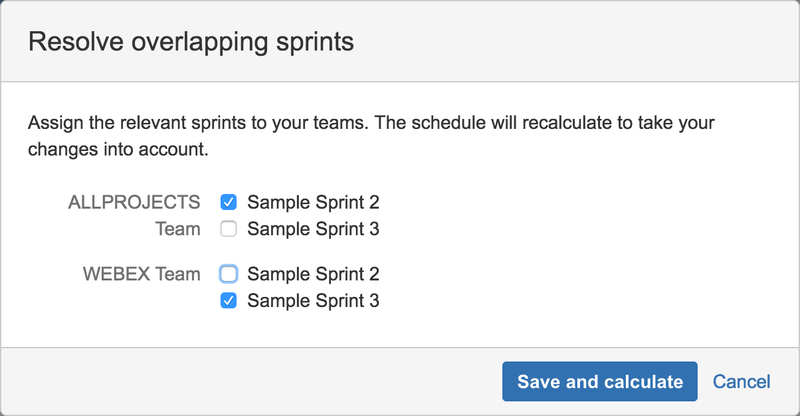 Select the checkbox for the sprints that you want to assign to the team. You can also assign multiple sprints to the team if necessary. Click Save, and recalculate your plan.